If I could name off my top five movies of all time, The Wizard of Oz has made the list since I was a kid. Now I get the chance to share in a little fun with my munchkins with a special event this Saturday at North East Mall. The Simon Kidgits Club at North East Mall invites you to click your heels to celebrate at the free The Wizard of Oz’s 75th Anniversary event this Saturday, Sept. 14 from 1 – 3 p.m. in Center Court. Families can participate in a variety of The Wizard of Oz inspired activities to revel in the charming tradition of the yellow brick road including craft-making, coloring activities, cut-out character photo opportunities and exclusive movie-focused giveaways. Children will also receive a map which leads to various stations that feature viewings of The Wizard of Oz film clips. 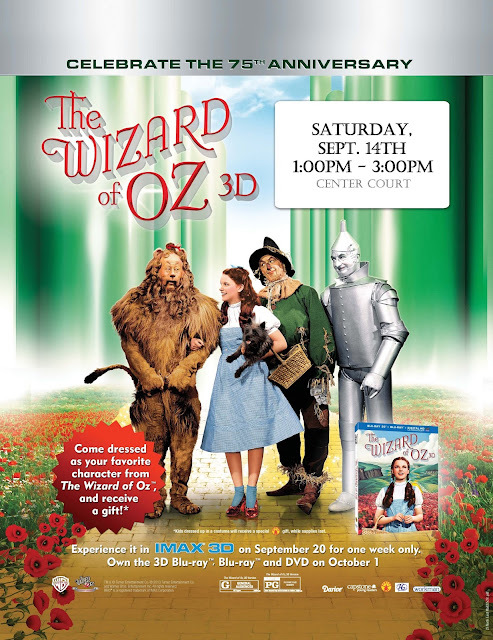 The event surrounds the anniversary of the beloved film with Warner Bros. relaunch of The Wizard of Oz 3D Sept. 20 in IMAX® 3D format and an exclusive one-week engagement in IMAX® theatres across North America. Sept. 14, 1- 3 p.m.
HOw fun! I haven’t yet introduced my daughter to this favorite! I love this movie, too! How fun! I can’t wait until mine are a little older and can really enjoy it, too. I have to tell my next door neighbor about this. Her daughter LOVES the wizard of oz! 75 years since The Wizard of Oz was released? Wow!